This is the fifth installment of the memoir of Bryan G. Sherman, written in 1974-5 when he was 82 years old. Previous installments can be found down page and by following the March and April archives links found throughout the site. 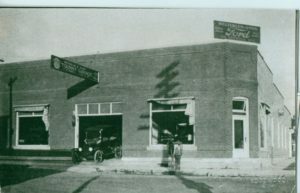 The ” Welterlen & Sons Tourist Garage”. This building was put up by John J. Welterlen, and his sons Frank & Art worked there. Eventually Frank formed F.E. Welterlen Motors, and Art Welterlen branched off and sold Ford farm tractors and implements. Grace and I left that evening on the train from Oneida for the city of Des Moines where we spent our honeymoon. While there, we visited the capital, but the weather was so bad we didn’t get out much. We returned home on Sunday and at once took up our abode with my family, who at that time consisted of Dad and Mother, and little 5 year-old George Hagensick who was being cared for by my mother after my sister Verna’s death from cancer. Sisters Letha and Myrtle had both been married and moved away, and my three brothers were farming on their own. A few nights after we returned home from our honeymoon, we were shivareed by a bunch of friends who came out from town. We had rather expected it so were not surprised when they came. A couple weeks after our marriage my Dad took sick, and early in the month of June he passed away just a few days before his 65th birthday. After his death and when the estate was settled, I took over the management of the farm. I was also appointed trustee of the estate. I was on half-share rent with Mother until her death 10 years later. Mother passed away in 1931 and the estate was settled so each survivor had a share. The four boys got the land, and the two girls and George Hagensick (Verna’s son) were given a cash inheritance. It was in the second year of our marriage that our first child was born, a girl. We named her Marilynn Annette. This was September 6, 1922. Sometime during the next year or so, mother moved to town where she lived with my brother, Fred, and his wife Carrie until she bought the house now used by Charles Jacobs (The Sherman/Jacobs house is owned in 2018 by Karl & Carol Worsham). In 1925, on July 30, our 2nd child was born and this time a boy – we named him Kenneth K.
From then on, work was just routine except that same year I had an operation for appendicitis at St. Luke’s Hospital in Cedar Rapids. I was there for 8 or 10 days, but having a hired man at home, the work went on as usual with some help from my brothers. I had to take it easy for a while after getting home, so I built onto the south side of the chicken coop to make room for more chickens. This new part was used as a place to feed and water the chickens and as a scratch pen. The old part was for roosting and laying. I could help some with the chores, but I got out of such things as shredding corn which we did quite a lot of those days. (See editor’s end note***) From then on as the children grew, it was seeing to the children’s school and regular farm work. The children attended the same one-room school in the country that I did, Lodomillo Township #1, except a little more modern. Now before going to high school they had to pass 8th grade exercises after which they went to Edgewood High. Marilynn went first, of course, and she graduated in 1940 and Kenneth in 1942. After graduation Marilynn attended Dubuque University one year and then went on to Chicago to study nursing in a large hospital there. She was there about a year, and while there became ill and had to have an operation on her kidney, coming home to convalesce, and she never did go back. Marilynn then went to Seattle for a while and had a job there in a nursing home. This proved beneficial to her, as was the training she got in Chicago, and qualified her for a job in the nursing home here in Edgewood when it was built in 1961. She still holds that position at this writing in January 1975. Kenneth, upon his graduation from high school, wanted to go into the service of his country, engaged at the time in WW II, so at the age of 17 we let him enlist in the Navy. We would have liked to have him stay at home and help run the farm but like many youngsters, there are greener pastures away from home. One spring brother Fred came out and we fixed a big kettle and a homemade pan and made maple syrup in the woodshed. (The large, shallow sheet metal pan was placed over a wood fire to finish cooking the syrup—Ed.) This was on a much larger scale than when mother used to make it in the kitchen on the old cook stove. We hauled the sap in 10-gallon milk cans. That spring we made quite a lot of syrup and some sugar. Several years before, when Dad was still alive, we had bought two hundred 10-quart pails and hollow metal spiles on which we could hang the pails to collect sap. These had been used down on the bluff in the back pasture by Mr. and Mrs. Jud Steefer who made syrup on shares for a couple of years. Dad and Jud had made a log cabin big enough for the Steefers to stay in while working on the syrup. They also made a log shed to stable the horse that was used to haul in the firewood and the sap. The sap was cooked in large kettles hung on poles. The second year they also had a pan to cook syrup. One year my wife and I made maple syrup in a building down on brother Ernest’s farm next to ours. Then later on we fixed up a place in the pasture in back of the barn. This was after Fred started helping us and we could carry a lot of the sap in from near the camp. We never let this interfere with spring work as we generally quit about that time or Fred finished it alone. Since leaving the farm, I first rented it to my nephew, George Hagensick, and then finally sold it to Robert and Rayma Fisher when George wanted to leave the farm. I have worked at different jobs since moving to town, but mostly for Spahn and Rose Lumber Company where I got my Social Security. After retiring at 65 I only worked part time as I had taken out my Social Security and could only earn so much. Later my nephew, George, bought Fobes Hatchery and I helped him out there. I had worked some there before that and was familiar with the work. We had an egg route, stopping at farms picking up cases of eggs (30 dozen per case), and storing them in a cooler at the hatchery until they were picked up once a week by a truck and taken away to a processing plant. Later on, a processing plant was established in New Hampton, and we hauled eggs up there, often making two trips per week with a truck full of eggs. George also sold chicken feed, and I used to help load and unload that until I could no longer do the lifting. He also hatched baby chicks for a few years from fertile eggs procured from local farmers, and sometimes had several thousand chicks in incubators in the basement of the store. That made lots of extra work to feed and water and change the papers in the bottoms of the trays everyday (to remove droppings!–Ed.). He doesn’t hatch his own chicks anymore but buys newly hatched chicks from suppliers, and he sells those to his customers. Next installment–a trip to the West Coast. ***Shredding corn–At the time Bryan was farming, some corn was picked by hand in the field, while some corn was cut by a machine called a corn binder while still somewhat green. 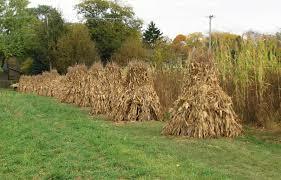 The binder tied a number of stalks into bundles about 8 or 10 inches in diameter and dropped them on the ground. The farmer would then gather several bundles, lean them against one another, and tie them with a cord to form a corn shock. The Amish in our area still harvest some corn using this process, and shocks of both corn and oats can be seen on their farms during harvest season. Once the corn had dried, the shocks would be loaded by hand onto a wagon and taken to a corn shredder, a machine that would separate the ears of corn from the stalks, and chop the stalks and leaves into fodder for feed and bedding. This whole business is incredibly hard work. In addition, the shredder was a dangerous piece of equipment responsible for the loss of many hands and arms, and many deaths. 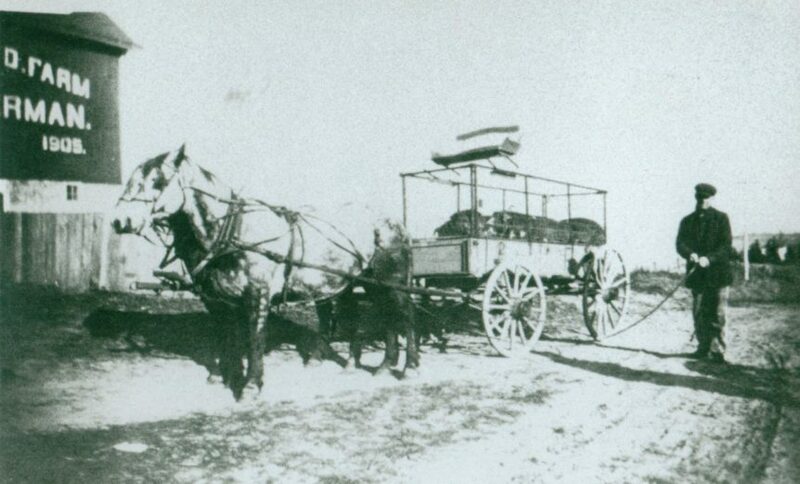 Click here for a short video of horse-drawn corn binding.